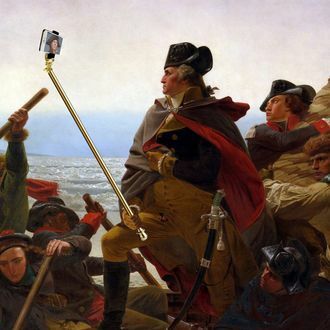 Would George Washington Have Used a Selfie Stick? In Emanuel Leutze’s famous painting of George Washington’s trip across the Delaware River, the general gazes across the icy waves, thinking deep thoughts about war and freedom, how ungodly cold it is, and how amazing he looks posing like that. Washington was probably not thinking about how many likes a selfie of said scene could have earned on Instagram, according to a column published on Tuesday in The Wall Street Journal. After informing his readers that our first president wouldn’t even shake hands with his constituents — “George Washington did not shake hands as president and would grip the hilt of his sword to avoid having his flesh pressed” — Bret Stephens explains President Obama’s latest failure to live up to the George standard. It took place during an interview with BuzzFeed. This is also not the first time that George Washington has been brought back from the dead to cast aspersions on the 21st century. It turns out that George Washington would have hated Edward Snowden and the tea party. He would have never apologized. According to Chuck Norris, “George Washington wouldn’t have completely undermined the very heart and soul of the military as Obama did” in regards to the Bowe Bergdahl exchange. Most important, he would have had serious reservations about the American Dental Association. Would G. Washington Have Used a Selfie Stick?